Crane Pumps recently recognized Southern Sales Company, a division of Tencarva Machinery Company, as their #1 municipal distributor in total sales for 2015. 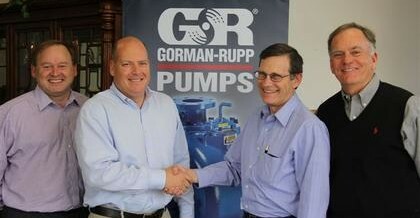 Many thanks to our customers for choosing Southern Sales Company as a trusted partner for Crane Pumps. A state-of-the-art repair service center with the first of its type capabilities in Tennessee is a central focus of the new Nashville Branch Office facility of Tencarva Machinery Company LLC, based in Greensboro, N. C. with offices in Chattanooga, according to Edwin W. Pearce, III, president of Tencarva. The firm relocated its Nashville operations to its new facility at 2937 Kraft Dr. in Nashville, combining into one location its Nashville Branch Office and the Southern Sales Division. Greensboro, NC — Tencarva Machinery Company, a distributor of pumps, pumping systems, fluid handling systems and related products, headquartered in Greensboro, N.C., has acquired the assets of Southern Sales Company Inc., of Nashville, Tenn., a municipal sales and service organization, effective November 30, 2012, according to Rod Lee, president of Tencarva.